Like Captain America and the Amazing Spider-Man, anytime you try to rate, or list the best Superman comic books stories you are bound to run into naysayers. Few comic book collectors or movie buffs, however, could argue that the Superman story is a long one, harping back to the golden age of the comic book industry. This beloved comic book superhero is bound to stir up contention about which stories are the best and why those are just the facts. Given the 75 plus years Superman has been around it’s somewhat difficult to narrow them down, but therein is the challenge one must accept. This particular list will give you the four of the best Superman comic book stories, in no particular order. Readers obviously have the right to agree or disagree and this is what the list is here for. Enjoy. This particular Superman story makes our list because it delivered on the hype it promised. Released back in 1992, the story of Superman’s death was released to rabid fanfare to all of those who wanted to see how and why Superman dies. It really breathed new life into the Superman series as many fans believed the unmatched power of Superman somehow made the comics less interesting, as none of his enemies really stood a chance. Of course, this is certainly a matter of opinion, and many fans didn’t feel this way. Nevertheless, when the comic was released it was sold out nearly everywhere in a matter of hours. DC comics shipped between 2.5 and 3 million copies because of the interest and hype surrounding it and still many people had to wait to get their hands on a copy. Without spoiling the story for those who have yet to read it, all you really have to look at is the iconic cover art which shows our superhero, beaten and tattered in the middle of Metropolis seemingly dying in Lois Lane’s arms. I certainly remember seeing the image for the first time in a comic book store and it literally brought tears to my eyes. Not only did this engaging story bring many new fans to the Superman franchise, but it reinvigorated longtime fans as well. 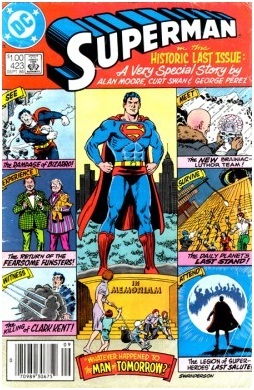 This six-part series written and drawn by John Byrne was released in 1986 and, similar to The Death of Superman series mentioned above, breathed new life into the series by toning down Superman’s powers, and introducing a somewhat new and less confusing backstory. Byrne took away over-the-top powers such as traveling at the speed of light and moving planets effortlessly, and he also modernized and somewhat simplified his backstory as a way to bring in new fans. His artistic style was also a way to portray the man of steel as somewhat vulnerable and more related. His costume was no longer indestructible, but rather made of simple cloth that could be torn. This added a more dramatic effect to the story because readers could see his suit being ripped which added to the tension. Also, Clark Kent was no longer “mild-mannered”, but rather more confident and exhibiting a wider set of emotions than in earlier comics. The first issue of seriessold 200,000 copies and it’s widely considered one of the best Superman comic book stories of all time and for a new explorer of action comics is a great Superman buy. Released in 2005 and spanning twelve issues, this Superman tale is unique and interesting in a multitude of ways. Without giving too much away, the authors of this comic took a new approach to Superman that truly encompasses what the Man of Steel represents. The authors Grant Morrison and Frank Quitely portray Superman as reflective and complex as he tries to figure out what he will do with his final days on Earth after being poisoned by Lex Luthor with insane amounts of solar radiation. This leads to an incredible story that many believe is one of the best in the history of Superman. It has aspects of earlier adventures, but with new twists and turns, as well as incredible heart-wrenching stories never before told. The comic, not only was a critical success, but also a commercial success ranking in the top three bestselling comic books of that particular era. Superman fans were impressed with the way the authors were able to capture the true essence of Superman’s relationship with the Earth and its people, which is not an easy thing to do with such a beloved and perhaps difficult character to write about. Written in 1986, this Superman action comic is a what-if retelling of Superman’s supposed final days and disappearance told by Lois Lane to a reporter at the Daily Planet. It portrays Superman as more emotional than ever before. Without spoiling anything for those who have yet to read this fantastic story, it touches on Superman’s pain and angst and how he deals with the people he has affected and what that has meant to him. The author received a lot of critical praise for this approach and it has never really been replicated. Seeing and reading about Superman questioning his life’s work and coming to grips with the morality of his decisions is a something that will grab the reader immediately and drag them into this great story. There’s certainly more to this story than an emotional Superman contemplating his life’s work. There are epic battles to the death making the story have all the great elements fans expect and want from the superhero. As mentioned above, this list is by no means a concrete guide to the greatest Superman comic book stories, but rather a fun way to stir up conversation about these great stories and what they mean to both casual and rabid fans alike. It’s an impossible task to create such a short list without leaving something out due to the sheer amount of great Superman stories written throughout the years. It is fun to discuss and debate these lists as fans of the comics and that was the intention.